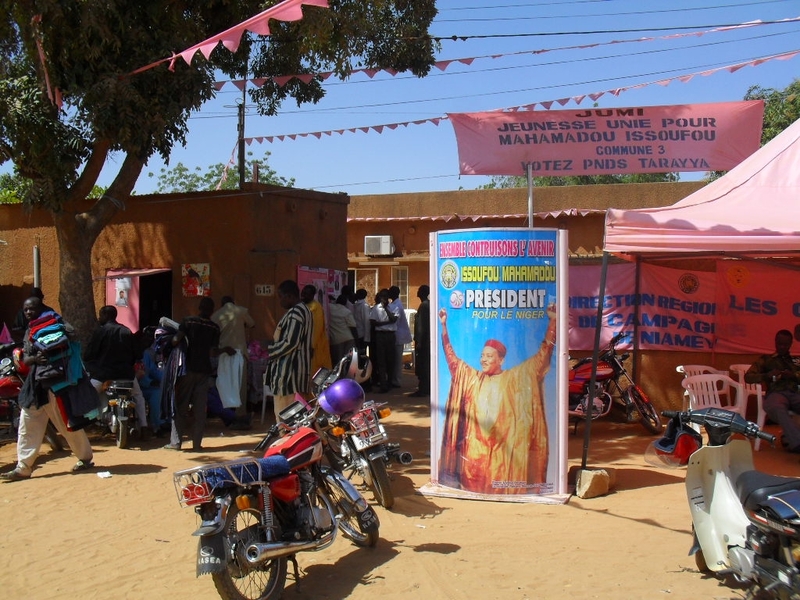 The PNDS Campaign headquarters in Niamey, photo from Niger Elections. The 31st of January saw Niger’s Legislative elections, combined with the first round of the Presidential elections. Results are not yet known, and the top two in the Presidential race will re-run on 14 March. Here’s some tools to follow it. The best immediate updates on the polls and count can be found at the African Elections observer site’s @NigerElections Twitter feed as well as their news site at africanelections.org/niger. Their photo gallery is also wonderful (and the source for the image above). [UPDATE 2:40 GMT Feb 2 : There are no official results yet announced. Rumored provisional results are being passed around — an example is here — but their simple repetition of the urban conventional wisdom makes them either suspect or expected. Mahamadou Issoufou (PNDS-Tarayya) in the upper 20s, followed by either Seyni Oumarou (MNSD-Nassara) and/or Hama Amadou (MODEN/FA LUMANA) from 20% to 24%. This would match both the aggregate Municipal/Departmental election results of January and the relative profile of the parties. While Issoufou is the favorite, there is no accounting for tactical endorsements for the second round. Note that an RFI reported telephone survey (seen via Sahelblog) reporting Issoufou with over 40% support seems a possible result of sample bias towards urban educated voters. A run off is almost certain, and the questions will be how Legislative results set the stage for the new government, and whether the PNDS faces the new MODEN LUMANA or the MNDS, reversed in last years coup. Each could color the results — and the mandatory backroom deals — very differently. The reports of attacks by PNDS militants in their heartland of Tahoua, as well as unconfirmed charges by Hama of fraud and intimidation against his party in Tillaberi and Niamey, are not evidence of some general breakdown in law or a pattern of vote-rigging. Apart from 17 polling stations in Tassara (which seem to have been foiled by some local communal conflict), and reports of chronic petty delays and procedural fumbling, the poll seems to have proceeded in peace and openness. While turnout (30%-50%) is low, it is the historical norm, and some rural areas reported record-breaking numbers of women voters. ECOWAS observers, among 250 official NGO or foreign poll monitors, have seconded this impression. Rather they may be a prescient image of petty parliamentary conflict in the 7th Republic, not unlike that between the CDS and the MNSD of the early 1990s which drove the 3rd Republic into gridlock. Alex Thurston’s Sahel Blog has the usual informed coverage and discussion here and here. And of course, the best Nigerien news coverage is always collected on http://nigerdiaspora.com and http://tamtaminfo.com . UPDATE, INTERNET CAMPAIGNING: Nigerien politics has begun to capture the social media bug, especially in the sizable diaspora community. You can follow announcements from the two Facebook pages (here and here) of Hama Amadou’s Mouvement Démocratique Nigérien Pour une Fédération Africaine MODEN-FA Lumana (as well as their website), the two Facebook pages for Mamadou Issoufou’s PNDS (here and here and their French section here) and their official website (a French section also has a web presence). The MNSD, perhaps tellingly, has no Facebook presence apart from this “Free Mamadou Tandja” page. I might also note that the official MNSD website was never updated after Hama and his supporters split form the party in 2009. *Une élection présidentielle un peu trop calme(France24:The Observers): includes an inside look at the polling process and photo gallery. *Niger : Mêmes hommes, mêmes intrigues ? (radio analysis from RFI): Probably, would be my answer.